Complete your continuing education to renew your North Carolina real estate license today. All of our courses can be completed At Your Pace online in order to help you maintain your license. Once you finish your class you will have an official certificate of completion available and we will report your course completion to the NC Real Estate Commission for you automatically. 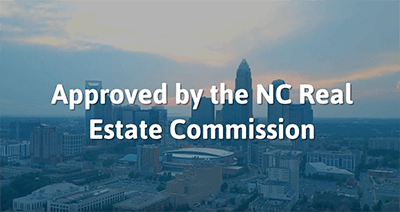 We are approved by the North Carolina Real Estate Commission (NCREC Sponsor # 1552). NC real estate agents need 8 hours of continuing education every year by June 10th in order to renew their license. 4 of these hours are required to be on the General Update or BICUP courses. The other 4 Hours are required to be on Electives. This course is approved to meet your 4 hour Elective CE requirement! At the end of this course students will be able to interact with other parties in a manner that is ethical and appropriate, produce a contract with language that is specific but also clear and understandable, and explain the rights of parties involved in an ethics complaint or ethics hearing.